Recently I had the “opportunity” to drive across a pretty wide swath of the country. I purchased a 2008 Pontiac Solstice from my father who lives in Pocatello, Idaho. To get it home I flew out to Idaho to pick up the car and drive it back to Columbus, Ohio. I was accompanied by my 19 year old son, Denver, who having just finished his freshman year of college had nothing better to do (although he would probably not put it that way). The most direct route from Pocatello to Columbus goes through such beer meccas as Cheyenne, Des Moines, and Peoria. Fortunately for the sake of this blog, a rare spring storm dumped over a foot of snow in Wyoming, Colorado, and western Nebraska, closing Interstate 80. This prompted us to take an alternate route home. We first drove north to Bozeman, Montana, a beautiful drive that cuts through a corner of Yellowstone park before heading east across Montana, South Dakota and southern Minnesota. Although it added 200 miles to the trip I was secretly happy for the detour, because the new route took us reasonably close to three breweries I’ve wanted to visit for some time—Iowa’s Toppling Goliath, Wisconsin’s New Glarus, and Indiana’s Three Floyds. In this post I describe my visit to Toppling Goliath, while later posts will describe stops at New Glarus and Three Floyds. Because we only had three days to cover 2000 miles it was necessary to keep roadside stops to a minimum in order to save precious time for brewery stops. Although it took more discipline than a monk struggling to keep his vow of silence in a karaoke bar, we managed to resist the urge to stop a variety of sites dripping with the rich culture of our nation, including the Potato Museum (in Blackfoot, ID), the TV & Pioneer Museum (in Rigby, ID birthplace of television), Wall Drug (in Wall, SD), the South Dakota Tractor Museum (in Kimball, SD), the Corn Palace (in Mitchell, SD), and the Jolly Green Giant Statue and Museum (in Blue Earth, MN). The place that was the most difficult to pass by was the Little Bighorn Battlefield in SE Montana. I’ve been there a couple of times and find it to be a fascinating and moving place to visit. A few years back when making a similar trip with my entire family we spent a couple of hours visiting the battlefield and museum there. As we approached the exit for the battlefield I asked my son what he had taken away from our last visit. After asking several questions that were met with answers not exceeding 3 words, I asked him if he could at least tell me the leader of each side in the battle. After 30 seconds of silence he said, “The humans were led by Colonel Mustard weren’t they.” That response is disturbing on so many levels I don’t even know where to begin. One can only wonder what US history would look like if President Grant had placed Professor Plum in charge of the 7th US Calvary division? 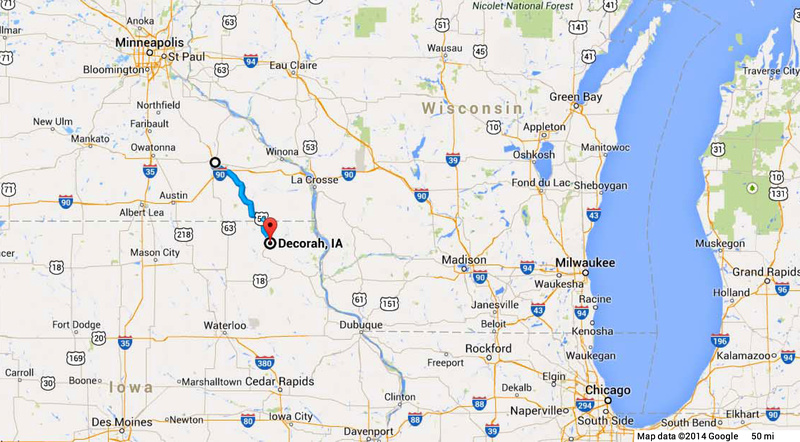 The blue line shows the route from I-90 to Decorah, Iowa. Having driven across Iowa more times than I care to admit I was expecting the landscape to be flat and covered with cornfields. So I was surprised to find that Decorah is quite hilly, full of trees, and has a river running through it (the Iowa River). It was settled by Norwegian immigrants and the local newspaper was published in Norwegian until 1972. It is home to the Vesterheim Norwegian-American Museum, which is apparently the largest museum in the country devoted to a single immigrant group, yet another cultural landmark that we had no time to visit. It is home to Luther College, a school run by the Evangelical Lutheran Church (the more liberal wing of the Lutheran church). The downtown still the feel of a small college town and is lined with local stores, restaurants and a few bars. It would be a pleasant enough place to spend a day or two. 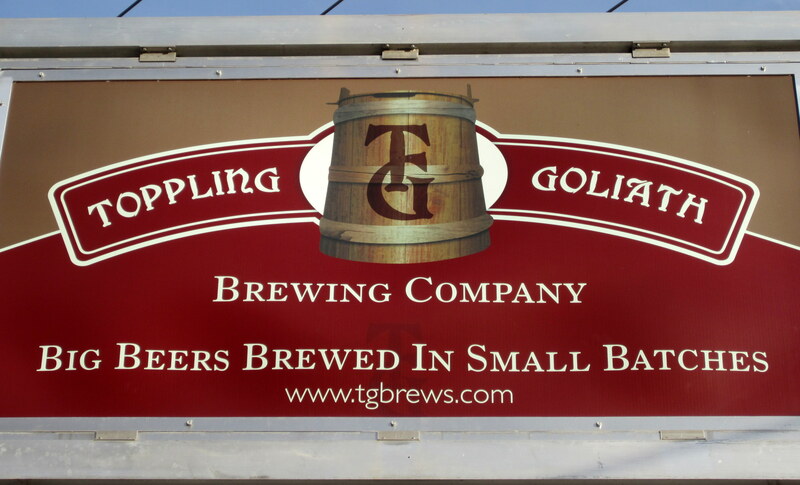 If you’ve never heard of Toppling Goliath you are not alone. They have only been open since 2009, they don’t bottle very much of their production, they haven’t won any medals at the Great American Beer Festival, and they only distribute their beer in Iowa and Wisconsin. I only know about them from occasionally perusing the beer rating sites, but if you do that kind of thing you too are probably familiar with Toppling Goliath. 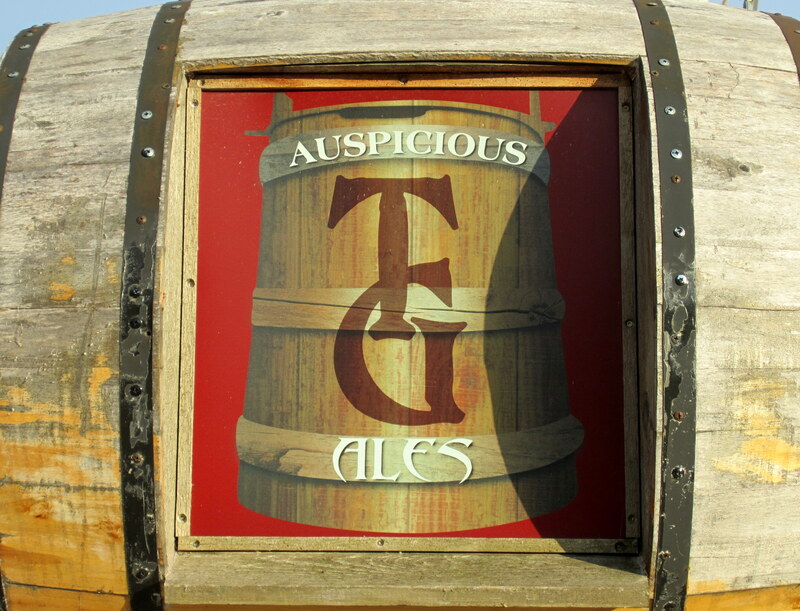 Their American Pale Ale, PseudoSue, is ranked the #2 APA in the world by both BeerAdvocate and RateBeer (right behind Zombie Dust). Their Imperial Stouts, Kentucky Brunch and Mornin’ Delight, are rated in the top 5 Imperial Stouts by both sites (Kentucky Brunch holds the #1 spot on BeerAdvocate). On BeerAdvocate’s list of the top 50 beers in the Midwest (defined as Iowa, Kansas, Minnesota, Missouri, Nebraska, North Dakota, South Dakota by BeerAdvocate) 4 of the top 5, and 10 of the top 50 beers, are brewed by Toppling Goliath. So I had to stop by and see if they could live up to the hype. A view of the Toppling Goliath taproom from the front parking lot. After checking into our hotel I headed over to the brewery, arriving about 7 pm on a Tuesday night. 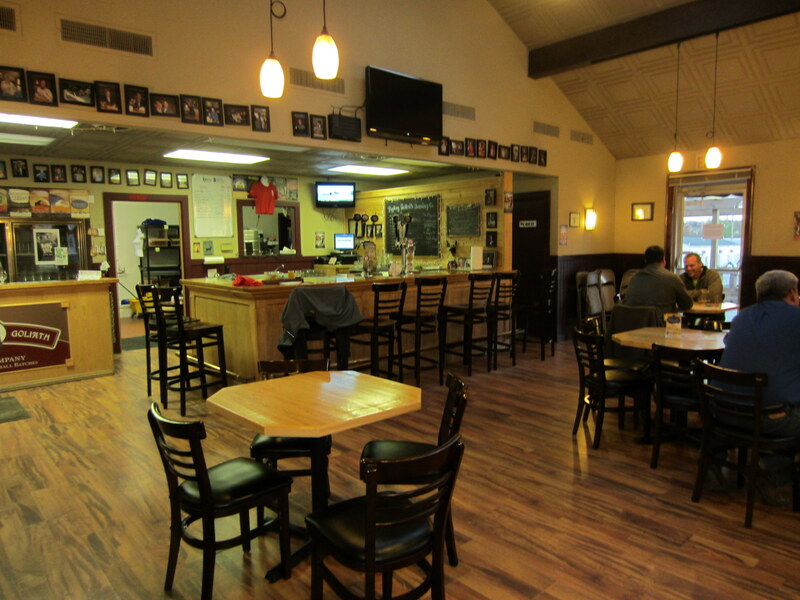 The taproom is reasonably large and well lit, with a hardwood floor, 10-15 tables, a bar with 7-8 seats, and a patio on the south side of the bar. There were about a dozen people in the tap room when I walked in. I proceeded to take a seat at the bar and ordered a flight. The flights cost $6 and consist of 3 oz samples of any four beers on tap. I was bummed to learn that they were out of PseudoSue, neither were there über popular Imperial Stouts available, but as they are special releases that was expected. Not too worry though, they had several interesting beers on tap, including several from their Hop Patrol series, a line of single hop beers, something that I always enjoy because I can better hone my palate to the tastes of individual hop strains. Since I was the only one sitting at the bar the service was prompt. The clientele were friendly and I struck up a couple of conversations with people who stopped in at the bar to fill up a growler. I had two flights of beer in the hour I had before the 8 pm closing time. Guided by advice from the bartender, and her husband who stopped in for a growler fill, I stuck to the hoppy beers. There were no duds in the bunch, every beer I tried was excellent. Mini reviews of each beer are given below. From left to right: Golden Nugget, Zeelander, Millennium Falcon and Naughty 90. Golden Nugget (Style = IPA, abv = 6%, IBU = 50) – A clear, golden colored ale brimming with fresh hop goodness. This hop-forward beer hits your palate with citrus fruits and grassy notes that trigger images of fresh hops. There is a hint of pine resin in the background. This is a crisp, refreshing beer that is imminently drinkable. One of the better IPAs I’ve come across in quite a while. Zeelander (Style = IPA, abv = 5.5%, IBU = 80) – This is a single hop IPA that showcases Nelson Sauvin hops from New Zealand. Like Golden Nugget it is clear and golden, leaving a nice pattern of lacing on the walls of the glass. Nelson Sauvin hops have a rather unique flavor in the world of hops. They meld grape like flavors, suggestive of Sauvignon Blanc white wine, with tropical fruit flavors (mangos being the most prominent to me). Some Nelson Sauvin hopped beers I have tried are downright catty (to my palate anyway), but thankfully Zeelander stops short of going over that precipice. This is one of the better Nelson beers I’ve had, comparable to Karl Straus’ Big Barrel DIPA, full of flavor and tasty in an unconventional way. Millennium Falcon (Style = Pale Ale, abv = 5.8%, IBU = 72) – A seasonal pale ale made with a mixture of Millennium and Falconer’s Flight hops. Given that recipe you’ve got to love the name. Unlike the first two beers this one is hazy rather than clear, with a golden orange color. Notes of orange are prominent in the aroma and the taste, accented by hints of lemon zest with a touch of black pepper spiciness on the finish. This one really grew on me and I ended up ordering one of these in both tasting flights purchased. It was probably my favorite beer of the night. 1492 (Style = IPA, abv = 6.0%, IBU = 45) – Another single hop IPA from the hop patrol series, this one features Columbus hops (hence the name). As one of the 3C hops I was expecting something with grapefruit and pine, but the flavor of 1492 turned out to be more complex than I expected. It’s fruity, but more tropical fruits than citrus fruits, dank and earthy, with relatively little in the way of either pine or grapefruit. I enjoyed it and learned something about hops in the process. Naughty 90 (Style = IPA, abv = 8.0%, IBU = 100) – This IPA is advertised as being aged on a bed of oak. While it would be cool to imagine that it was aged on Amish made furniture delivered to the brewery by horse and buggy, it probably means it was aged with oak chips in the barrel. Unlike all of the other IPAs I sampled at the taproom, this one was dark brown and hazy. The malts are prominent in this beer and they impart flavors of toffee and caramel. You know the hops are there, but despite the 100 IBU they don’t dominate the taste. In fact this beer reminds me of a scotch ale, but the massive dose of hops keeps it from being sweet as scotch ales are prone to be. It is interesting and definitely worth a try. Smoove Opferator (Style = Brown ale, abv = 5.2%, IBU = 40) – This was the only non-IPA I sampled (and yes my spelling of the name is correct). It has the dark brown color of mahogany and is completely opaque. It’s relatively hoppy for a brown ale, but the flavor is largely derived from the malts. The beer invokes taste sensations of caramel with hints of nuts in the background. The rich aroma and taste comes out more as the beer warms, so keep this one for last if you have a sampler. Now that I’m back home and writing this post I really wish I could try all of these beers again (and again). 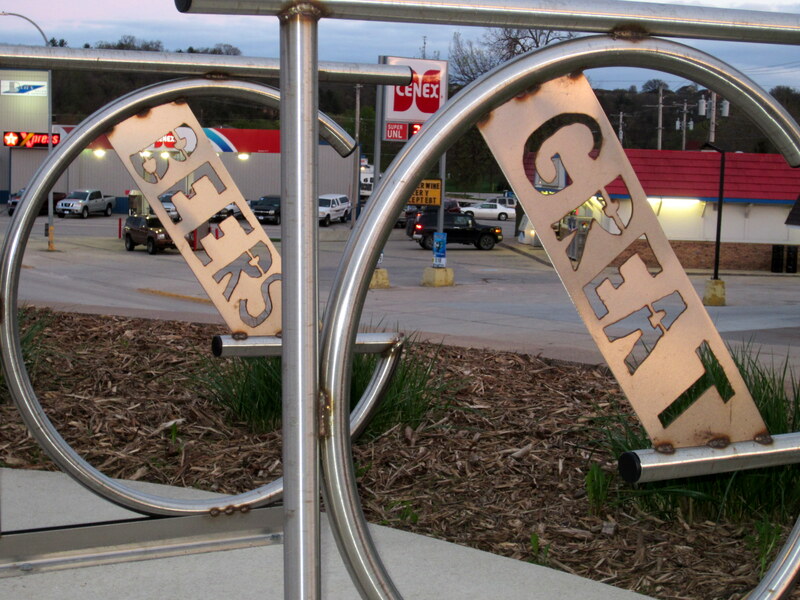 Here are some useful things to know if you stay in Decorah. Of the five motels in town we opted for the newly remodeled Super 8, which was decent and pretty affordable (about $80). 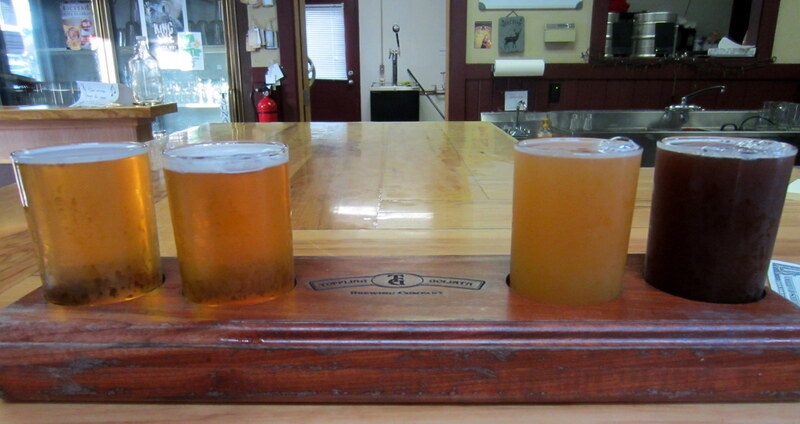 All of the motels are located 2-3 miles from the brewery on Highway 9 which runs on the outskirts of town, except the Hotel Winnesheik which is located downtown and closer to the brewery. Toppling Goliath only bottles a few of their beers, and on my visit there were no bottles available at the brewery. 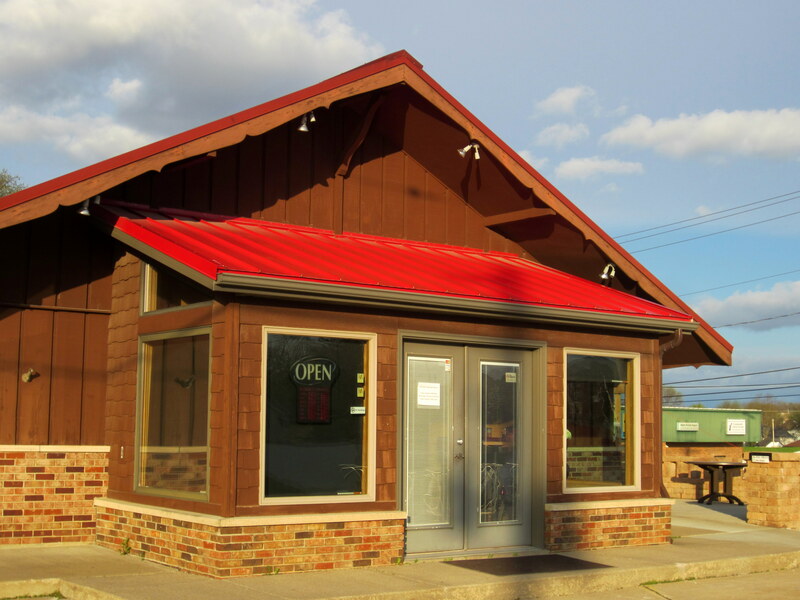 I got a tip from one of the locals that the Oneota Community Food Co-Op, located at 312 W. Water Street, does carry bombers of PseudoSue and Dorothy’s New World Lager (a Steam Beer that I opted not to try at the brewery). They have a small, but good selection of other Midwest beers as well. I stopped by there on my way out of town, but to my disappointment they also were out of PseudoSue. I picked up a few beers including a bottle of Dorothy’s and some stuff by Prairie Artesian Ales. We had dinner at T-Bocks sports bar and grill, on Water St. a few doors down from the Co-Op. They serve good pub fare and offer a couple of Toppling Goliath beers on tap (Dorothy’s New World Lager and Golden Nugget IPA when I was there). Toppling Goliath totally lived up to the hype and I didn’t even try their most hyped beers. I was disappointed to miss out on PseduoSue, but I’m told it is very similar to Three Floyds Zombie Dust, which I tried the next evening. If PseudoSue tastes exactly like Zombie Dust I don’t think it would have been the most interesting beer of the evening. Even though Toppling Goliath is located in a seriously out of the way place it was definitely worth the trip. It was the highlight of my trip home and probably the best brewery I’ve visited since The Bruery in Orange County back in March.